If you are interested in being a dealer for the DataRay Advanced Printserver, or other DataRay technologies and services, please contact Brent Scales, VP of Operations, at 800-477-5317 x 126. With THIS (Thermal Healthcare Interface System), you can provide your customers with reliable bar-coded wristbands and patient record labels as a plug-and-play solution without requiring additional system servers or the complicated integration of extra software to their Hospital Information System (HIS). It also gives them the ability to change label formats simply by changing the label report in their system without having to learn complicated label printer commands or programming. THIS is specifically designed to attach to and print barcodes from SIEMENS Invision, SIEMENS Pharmacy, I-Series, Unity, MS4, McKesson, and many other hospital systems as an immediate and efficient solution, offering the most cost effective means to move away from antiquated, unsafe, undependable embosser equipment. In contrast, THIS provides reliable and accurate medication, IV, and patient ID labels and wristbands with exceptional readability. THIS provides advanced features such as the DataRay Label Duplicator Code (LDC) also allowing healthcare professionals to print labels containing patient’s necessary information even if the Hospital Information System shuts down. By simply scanning the 2D barcode, DataRay printers can duplicate a label even when the network or Hospital Information System is down. The DataRay LDC Technology also allows labels to be printed at the patient’s bedside, for immediate labeling of blood or other samples collected, leaving no room for confusion during transport to the lab, or uncertainty of which sample belongs to which patient, narrowing the gap for human error and increasing protection of the patient. THIS allows your customers to print RFID wristbands and medication labels directly off the HIS. Through the use of radio frequencies to identify patients, RFID wristbands provide hospitals with wireless data transmission that, much like bar codes, save time and money but do not require scanning a bar code on the patient’s chart or wristband. By using the RFID wristbands, patient information can be read through and around the human body, clothing, bed coverings, and other non-metallic materials. This added convenience becomes substantially important with the introduction of automated medication administration systems, which require frequent verification of the patient’s identification. Automated medication checking with RFID enables all necessary information to be collected without ever waking or disturbing the patient. 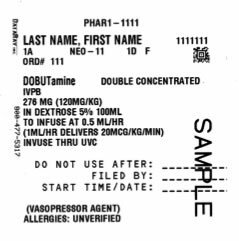 DataRay’s THIS provides Tall Man Lettering, a drug identification tool used in pharmacy labeling that is designed to reduce medication errors. Tall Man Lettering helps healthcare professionals detect certain drugs that could possibly be confused with other drugs due to similar names and appearances. By altering the way labels appear, medication mix-ups are more likely to be prevented. By implementing TML, the two drugs look drastically different. Using TML as a safety precaution could possibly save pharmacies from filling the prescription incorrectly and avoid delivering the patient the wrong, possibly harmful drug. The DataRay solution provides the customer with a modifiable list of TML words, including the drug names the FDA’s Office of Generic Drugs has established as prone to look-alike drug name medication errors, once again without the need for integrating additional software or servers into the Hospital Information System. Choosing a printer specifically designed to print these labels and wristbands eliminates numerous problems such as label jams, oozing glue, and frequent calls to the IT department. DataRay’s specially configured printers are small, quiet, and fast, allowing the user to conveniently print labels on demand as needed, doing away with consumables waste. Having few moving parts, DataRay printers are reliable and long lasting. Contact us today for Thermal Healthcare Interface System reseller information.